Welcome to the Winter 2019 issue of VAN. The first issue in the new year is packed with information. Featured in this issue is the upcoming annual meeting “Landscapes of Succession” in Philadelphia May 29-June 1. Other opportunities include a symposium “The Cultural Value of Everyday Places” and a study tour in China. Members have been very busy in the field in the past few months, and we have reports on documentation efforts in Utah and preservation efforts in Rhode Island as well as more in-depth articles from Oregon and Maryland. Members have shared wonderful news of publications and other achievements. To round out the issue is the newest bibliography packed with useful resources that span the disciplines that contribute to vernacular architecture studies. Thanks as always for the contributions to the newsletter, please keep them coming! Join us in Philadelphia, Pennsylvania May 29 – June 1, 2019 for VAF’s 40th Annual Conference. This conference explores the successive and overlapping built peripheries of the city, from the early 18h century to the present. Through a study of the zones around the city core, we take conference goers on a journey along the arteries and into the formerly peripheral urban zones that are now incorporated into and transformed by surrounding urban fabric. The conference documents the blurred divisions between city and countryside, commercial and residential, rich and poor neighborhoods over a landscape shaped by the rivers, railways and trolley lines, and interstates. The conference is headquartered at The University of Pennsylvania, in lovely West Philadelphia. The conference opens on Wednesday, May 29th, with a late afternoon-reception, plenary session, and awards ceremony held at the University of Pennsylvania’s School of Design. Three different bus tours on Thursday, May 30th, map the diverse architectural legacies of Philadelphia’s peripheries over three centuries, legacies which are often as jumbled as their changing historical narratives. Conference goer’s can chose from one of three tours: 1) Germantown & Northwest Philadelphia, 2) Darby & Southwest Philadelphia, and 3) Tacony & Northeast Philadelphia: Industrial and Residential Landscapes along the Delaware. At the end of the day, all busses meet-up at The Woodlands for a tour and reception. Weather permitting, food trucks will be available for those who wish to picnic together on the bucolic cemetery grounds. On Friday, May 31st, we’ll be in the city proper, with more than a dozen sites open as we self-navigate across Center City and the northern part of South Philadelphia. Friday’s self-guided walking tours focus on the urban core of Philadelphia and conference goer’s to places off the well-beaten National Park Service Path. 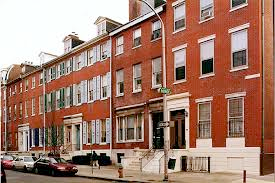 Five different self-guided tours focus on the 19h-century row houses, 18th-century residential space on Elfreth’s Alley, the mid-19th century formation of the central business district near 3rd and Market streets, the urban renewal of Society Hill in the 1950s and 60s, and a tour through Du Bois’s 7th ward. Saturday’s paper sessions will be followed by the banquet and final awards. These events will be held on the University of Pennsylvania’s campus in Houston Hall, the oldest student union building in the United States. Registration is open February 11, 2019. A complete conference schedule, along with registration fees and lodging options, is available on the VAF Philadelphia webpage. Register early for best tour selection and pricing! We would also like to draw your attention to several pre-and post-conference activities in Philadelphia. 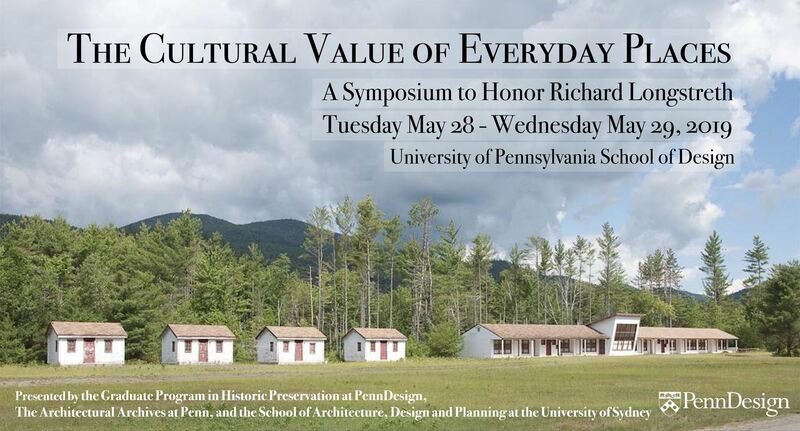 On Tuesday, May 28 and Wednesday, May 29th, the Graduate Program in Historic Preservation at PennDesign, the Architectural Archives at Penn, Rutgers University, and the University of Sydney are hosting a two-day symposium, The Cultural Value of Everyday Places, in honor of Richard W. Longstreth. A link to the symposium will be available on the VAF Philadelphia conference website. 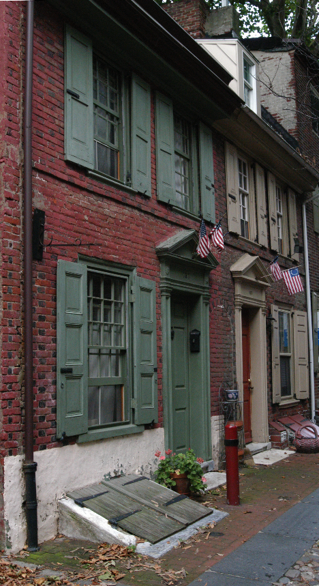 Finally, a host of guided walking tours of areas we can’t get to during the conference will be offered on Wednesday, May 29th and Sunday, June 2nd by Philadelphia’s Preservation Alliance, Hidden City, and the Chestnut Hill Historical Society. These opportunities will be posted on the VAF website and available on the VAF Philadelphia conference website. In mid-October the Boston University Ambassadors Award recipients hosted a round table discussion to share their experiences at the 2018 Vernacular Architecture Forum conference along the Potomac. Aaron Ahlstrom gave a brief overview of Vernacular Architecture as a field of study along with an introduction to VAF as an organization. Sam Palfreyman spoke about his longer participation with the conferences, explaining their structure and the opportunities he's gained from being introduced to the affiliated scholars and scholarship. Casey Monroe discussed the Thursday bus tours and shared his perspective as an art history graduate student who has been newly exposed to vernacular architecture. Maddie Webster talked about the Friday walking tours and the paper sessions on Saturday, demonstrating the variety of topics that fall under the VAF umbrella. Finally, Rachel Kirby spoke about the interdisciplinary nature of the conference and the fundamental attention not just to buildings but to the people who enliven them. 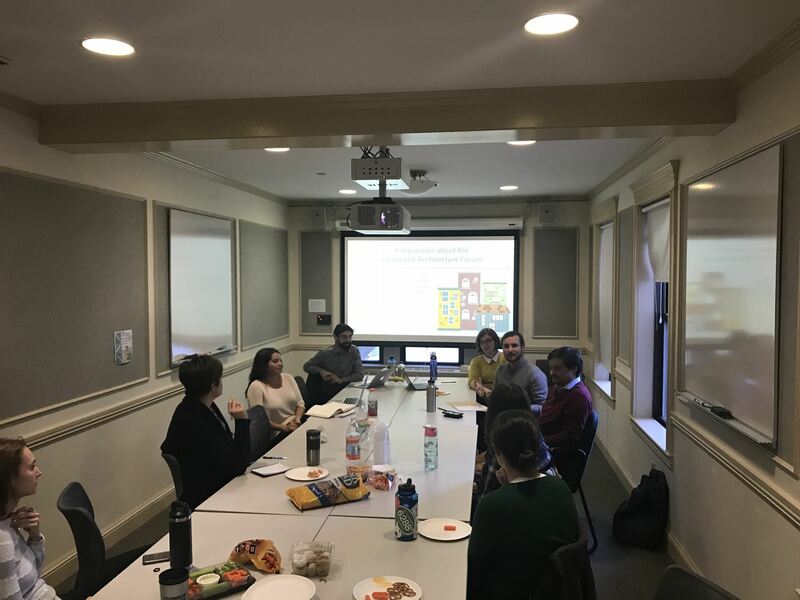 The talk was attended by undergraduate and graduate students in the History of Art and Architecture and American & New England Studies Program, and we do hope we sparked some curiosity about VAF within our fellow students here in Boston. Stone walls are tangible links to the past. The extensive network of stone walls throughout New England is a visible reminder of the region’s eighteenth and nineteenth century agricultural practices. Stone walls, sometimes interchangeably referred to as “stone fences” were constructed as property boundaries and barriers for livestock. These walls transformed the abundance of stone uncovered during the spring plow into something functional. Over time many of New England’s stone walls have fallen subject to disrepair, vegetation overgrowth, and have been lost to development. The threat of incremental loss jeopardizes the future of this iconic landscape feature. In an effort to mitigate this loss, The Preservation Society of Newport County and Preserve Rhode Island launched the Aquidneck Stone Wall Initiative (www.AquidneckStoneWalls.org) with generous funding from the van Beuren Charitable Foundation. The initiative’s current efforts are focused on the three historically agricultural communities—Newport, Middletown, and Portsmouth—that make up Aquidneck Island. To test this community-oriented preservation initiative, this collaborative effort has focused on repairs at two pilot sites with the hope of expanding the program in the future. Like stone walls, the pilot sites have a significant connection to the Island’s agricultural history. In December 2018, the first project was completed at Aquidneck Island’s oldest continuously operating farm, Simmons Farm in Middletown, Rhode Island. Repeated regradings of the road and the close proximity of trees led to collapsed portions of the 211-foot wall. Work at the second site will begin in the spring of 2019 at the Norman Bird Sanctuary, a well-preserved example of an island farm dating to the eighteenth century with nineteenth century additions. 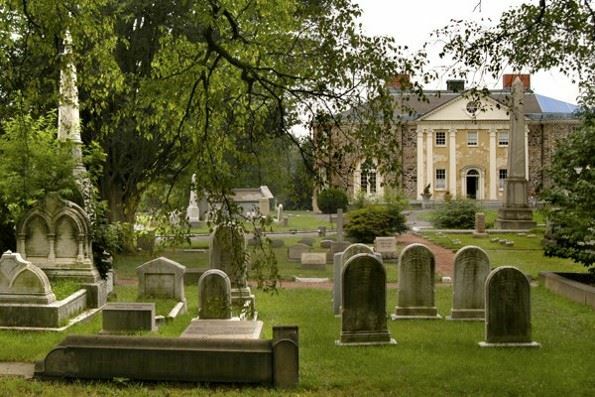 Its buildings and land holdings represent the history of the site and ownership as it transitioned from an eighteenth century owner-operated farm to a nineteenth century gentlemen’s farm and summer residence. While the focus of this initiative is the preservation of Aquidneck Island’s stone walls, our efforts have taken on another dimension: promoting the craft of dry-laid stone walls itself. The restored stone walls are constructed in the same manner as they were centuries before using the dry-laid method. Dry-laid walls do not use mortar but instead rely on stone placement, friction and gravity to keep them standing. By choosing to work with Robert Faraone, a Rhode Island-based stone mason certified by the Dry Stone Conservancy in Kentucky and The Stone Trust in Vermont, we are not only ensuring the longevity of these walls but also promoting this important craft. On November 9, 2018, the Utah-VAF Legacy Project took action to document six structures which Salt Lake City had approved for demolition. In a preservation battle that has lasted well over a year, Preservation Utah, the Utah State Preservation Office, and the community fought to save vernacular buildings that were built by one family: the Bishop family. There are census records and city directories that indicate Thomas Bishop and his family lived on the property as early as 1880 and by 1900, at least four of the houses in Bishop Place were already in existence. The exact dates of the other structures are unknown, but a Sanborn map from 1911 shows all of the structures. The developers of the site agreed to allow access for one day to document Bishop Place at the request of the Salt Lake City Department of Planning. The Utah-VAF Legacy Project was organized as a result of the 2017 VAF National Convention held in Salt Lake City. The purpose of the Project is to ensure the enduring collaboration established within the conference planning committee and teach specific documentation techniques which continue to spread the VAF’s view of the built landscape as a record of human behavior. While the future of the Bishop Place buildings was an undesirable outcome for preservation, our Utah-VAF Legacy Project group has been training for this. We held our first documentation workshop last April when the committee members were introduced to measured drawing by Dr. Tom Carter (see VAN summer 2018). August 2018, we held our second workshop and extended invitations to colleagues. So, after receiving word of the pending demolition of Bishop Place and the request from Salt Lake City Planning for help, we rallied our group to get documentation and measured drawings completed before it disappeared. As always happens, the weather didn’t cooperate, and the day served up sub-freezing temperatures. But that did not stop us. Using the processes learned in previous workshops, we broke up into six teams of three people and set out to measure, draw, and photograph the structures. What we found were that all the buildings had stories to tell, and treasures to find. 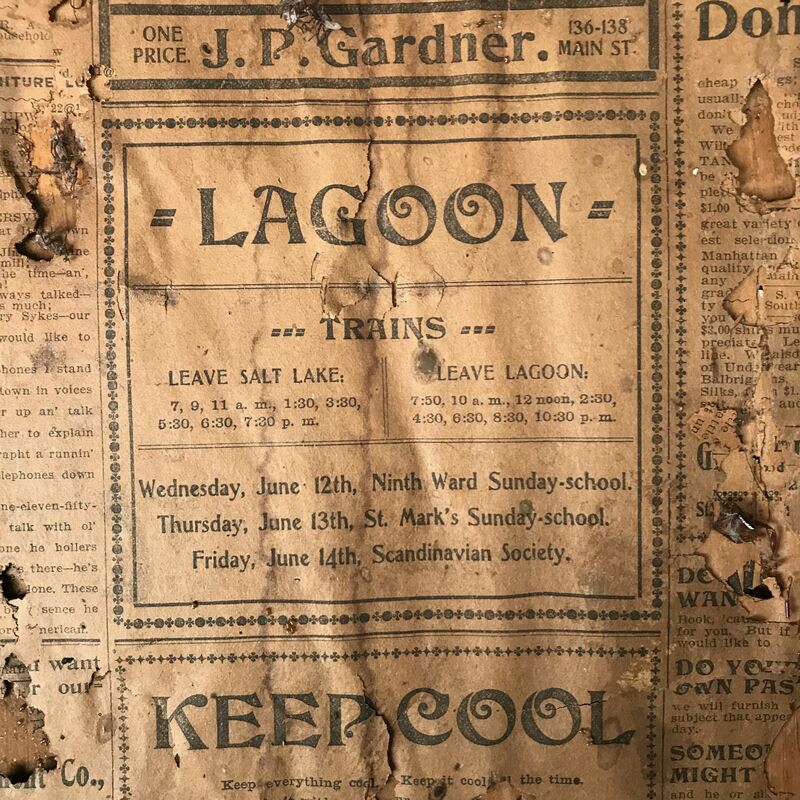 One of the houses had insulation made from newsprint with stories still legible dating to 1901 advertising Lagoon (a local amusement park) and the predicted date for the completion of the Pacific Coast Highway. The interesting things found while drawing these structures have led to increased interest in the history of the area. Archival research of the properties and the Bishop family have been used to share more information about the structures and the lives of the people who inhabited them. One of the great lessons we are learning from this project is that many people, especially in our local governments, do not realize that measured drawing is a tangible resource that can be created quickly, and for a relatively low cost. The Utah-VAF Legacy Project has been working to educate city officials to utilize our group as a resource. This day of Bishop Place documentation was the perfect illustration of what can be done to create a lasting piece of history for the family and the neighborhood as well as meet the developer’s obligation to document structures before they raze them. The arts have been a part of national parks for nearly 150 years. I got my shot in September. Oregon Caves National Monument and Preserve is one of over fifty parks around the country which offers an artist-in-residence (AIR) program. The programs are open to emerging and established artists of all disciplines and are competitive. 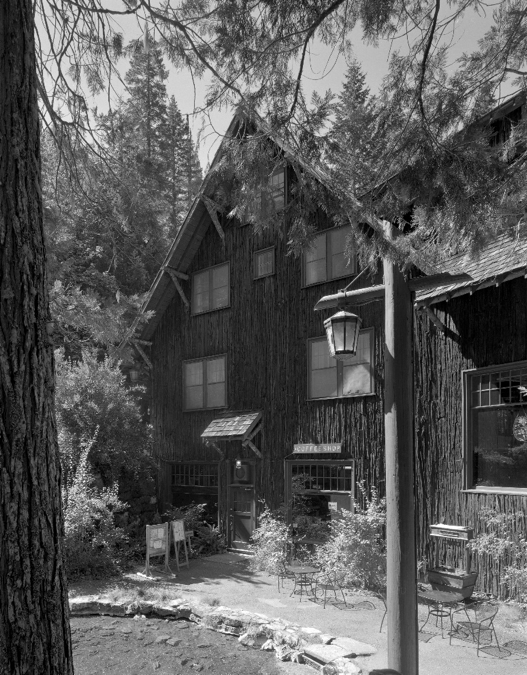 Oregon Caves’ residency includes two weeks of lodging in a private apartment within a historic building on site. My proposal was to photograph the Chateau at the Oregon Caves just prior to its closure for renovation on its 85th birthday. Since the nature of modifications will be character-changing, this seemed like an excellent point in time to make a visual record of the building. The selection committee agreed. So, with a carton full of black and white sheet film and large format camera in hand, I made the journey to southern Oregon to spend a fortnight living and working with rangers and staff at the monument and preserve. 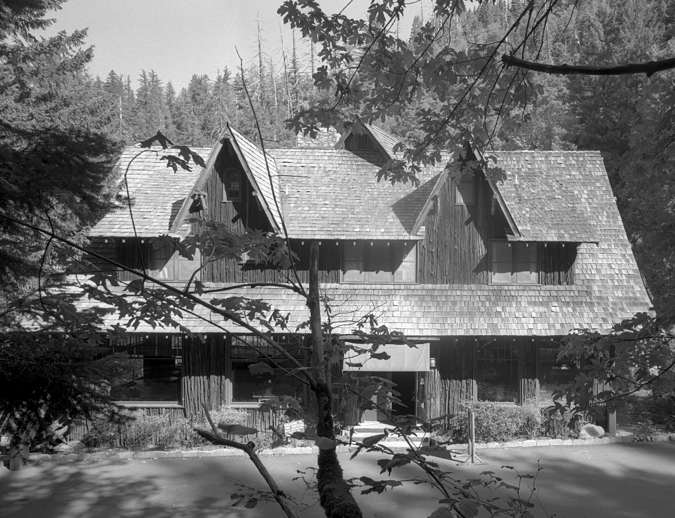 The West has no shortage of iconic, rustic lodges and the Chateau at the Oregon Caves is no exception. 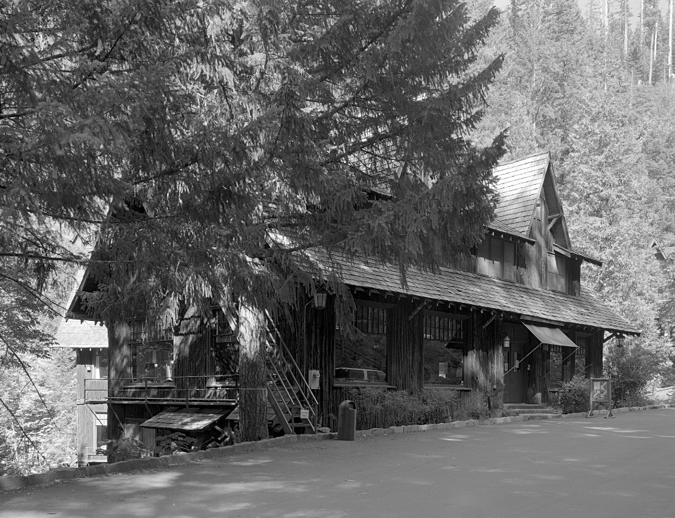 Built between 1931 and 1934 by local architect Gust Lium, it is sited over a small gorge where the River Styx, as it is called, exits the mouth of the Oregon Caves. 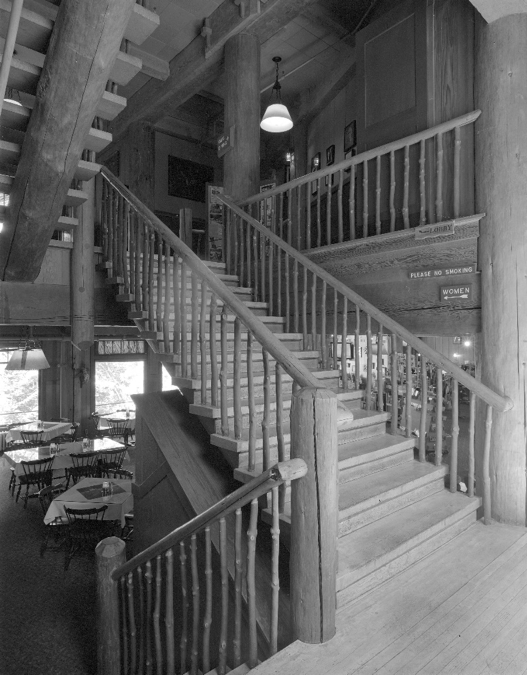 The lodge is a six-story, heavy timber structure clad in Port Orford cedar which retains its bark giving the exterior a rough, shaggy appearance that blends in with its surroundings. Its upper stories sit beneath steep gable-ended roofs with long shed dormers that are broken up by more gables. 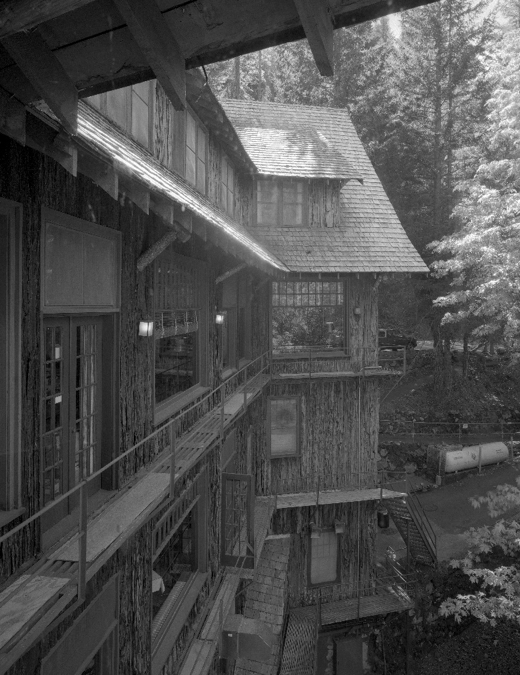 Retaining walls and a pond were built with stone from the site by the Civilian Conservation Corps immediately after construction was completed on the lodge. The creek fills the pond, then travels lazily through the chateau’s dining room before continuing on its way downhill. For a time, the pond was stocked with trout. Deep balconies once spanned the downhill side of the building but, as they were not designed to handle snow loads, they eventually had to be removed. 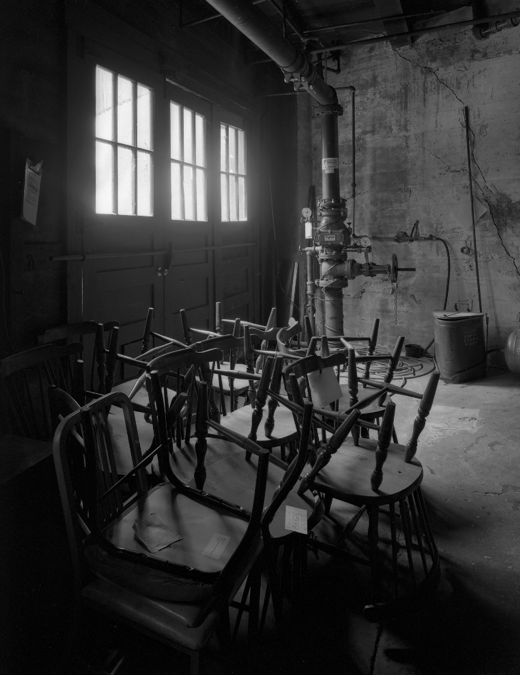 They were replaced with fire escapes made of narrow wooden catwalks with pipe railings and metal stairs. 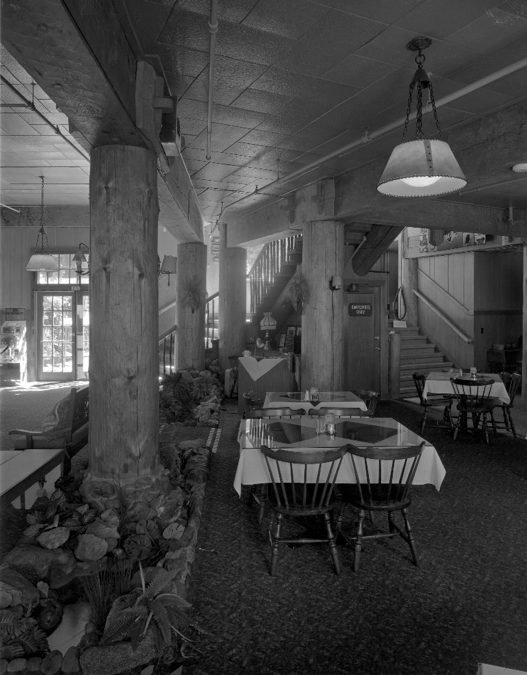 The interiors are dominated by a frame of enormous square timber beams and round columns. Walls are finished in redwood wainscoting with pressed fiberboard above and on the ceilings. 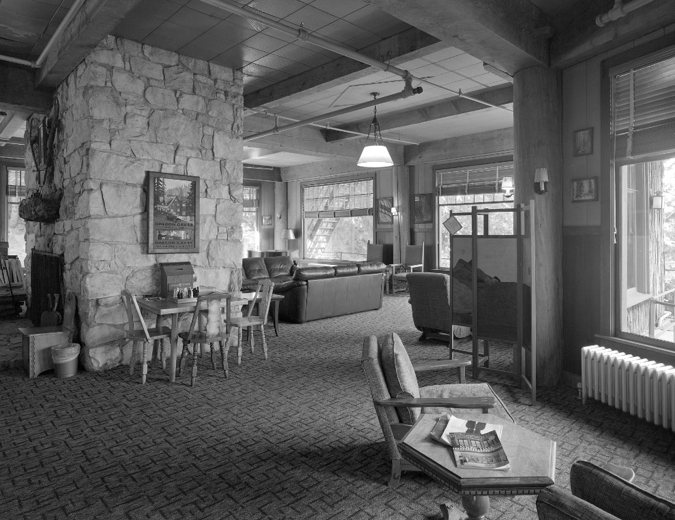 The lobby features a double-sided fireplace made of marble that was blasted out of the hillside during construction. All other heating throughout is by steam radiators. 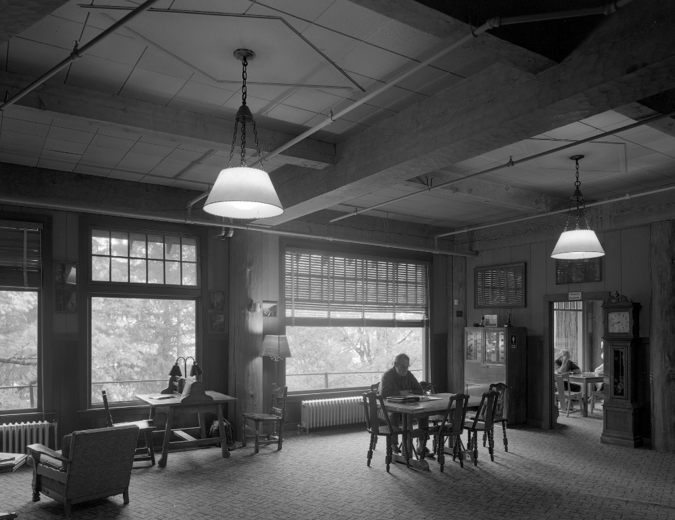 The lobby is still furnished with its original Mason Monterey wooden tables and chairs made by the Mason Manufacturing Company of Los Angeles. The Chateau’s collection represents the world’s largest single assembly of this style of arts and crafts furniture. The dining room on the third floor was designed with a portion of the River Styx, diverted from the pond outside, brought through. 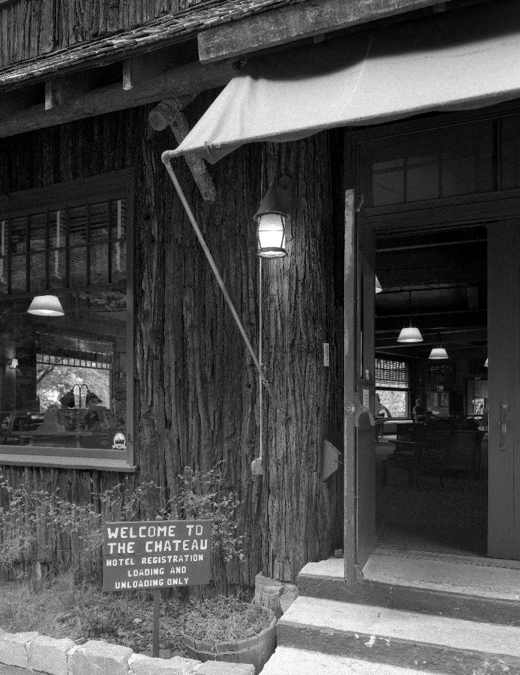 In 1936, a flood rushed through the breezeway of the adjacent Chalet and into the Chateau. The force of the flood moved the heavy timber structure seven inches off its foundations. Bulldozers and chains were used to gradually pull the building back, an inch per week over two months. 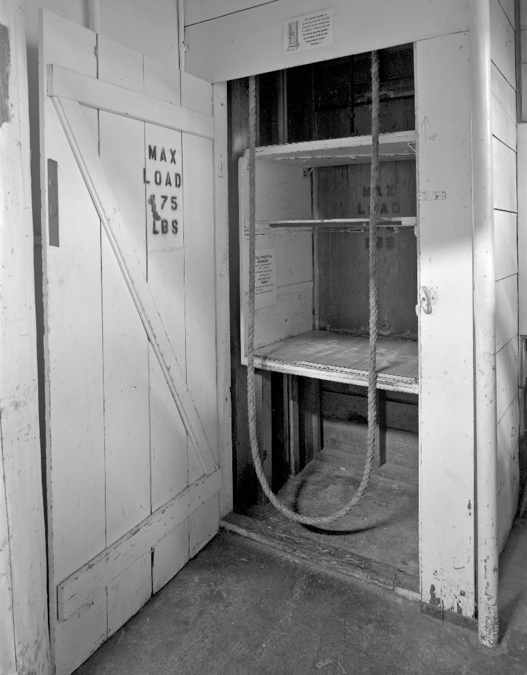 Storage space on the third floor was converted into a coffee shop in 1937. 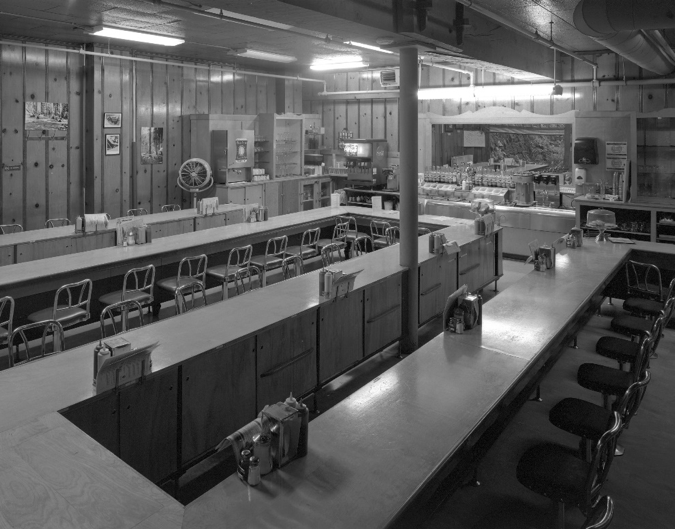 A long serpentine counter with swivel chairs were installed in 1954 to double the previous capacity. A post was also added to support a beam cracked by the earlier flood. The design provides servers with easy access to a large number of customers as well as an abundance of cabinets. I noticed that it also inspired socialization amongst strangers. Up to this point the Chateau has survived largely unchanged. 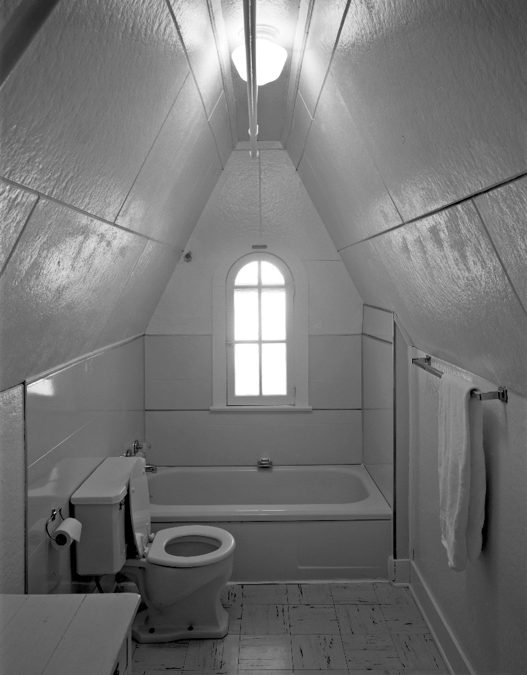 New lavatories and light fixtures have been installed in many of the rooms. Some of the wooden floors have been carpeted and several spaces are populated with incongruent furnishings but, overall, guests experience it very much as one would have during its period of significance. The twenty-three guest rooms vary widely in shape and configuration. 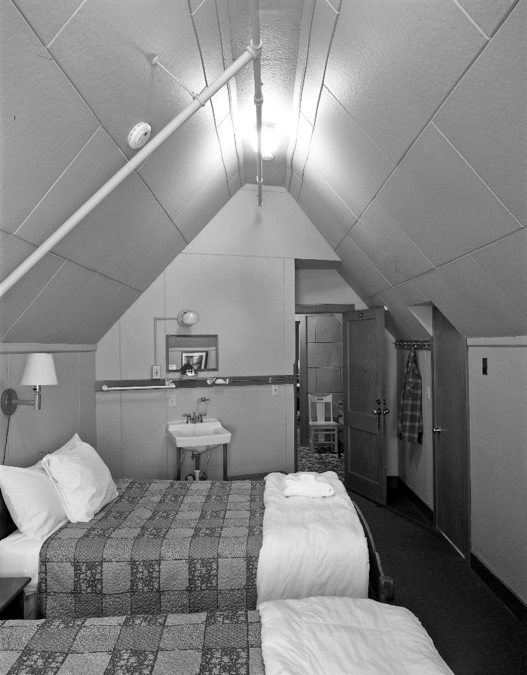 Fourth and fifth floor rooms are generally more spacious while rooms on the top floor reflect the geometry of the roof. 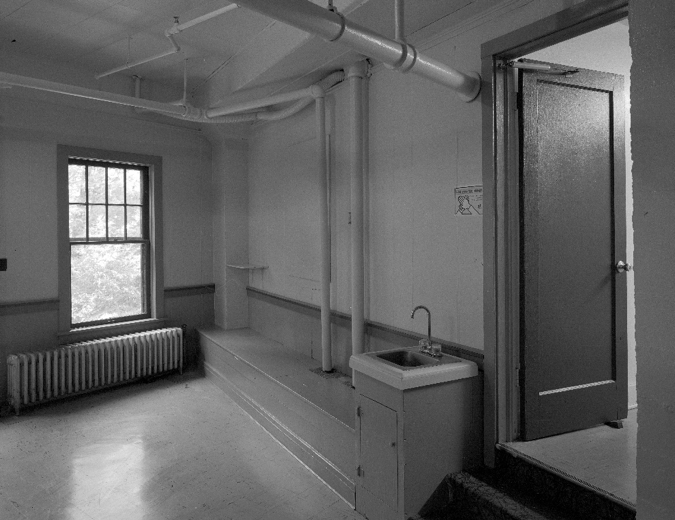 Corridors are extremely narrow, rooms are tight, and accessibility is a challenge. Steam heat is more effective in some parts of the building than others. And yet these characteristics are part of what makes the building, and the experience of staying here, so compelling. 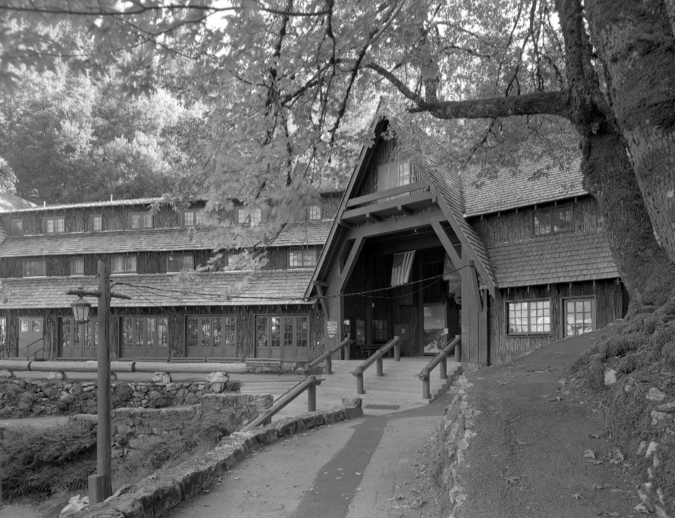 It will be interesting to see if the planned renovations will be able to retain the personality of the lodge or will wash it away. One of the goals of the residency program is for the artist to interact with the general public. This is self-directed and can take a variety of forms. Since setting up a large format camera is intensive and deliberate, and visitors were invariably curious, I gave impromptu demonstrations as I worked. I explained the process and let people get under the blackout cloth to see the image on the ground glass. We talked about the extreme resolution of a large format image, the archival permanence of black and white film, and the importance of keeping a physical artifact as part of the historical record. I treated my time as a documentation project but, since the purpose of the residency is to provide time for creative reflection and experimentation, I did not strictly follow the HABS guidelines. 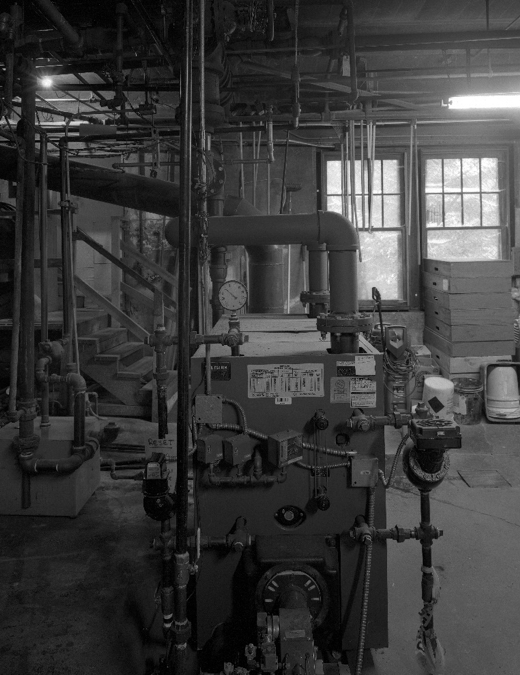 In addition to public spaces, I was able to explore the basement levels where the storage, plumbing, maintenance, and boiler room are where I made some long exposures with available light. Historic documentation is often triggered by renovation or mitigation. Consequently, budgets and schedules for record making are driven by factors that have little to do with the long-term importance or value of the historic record. 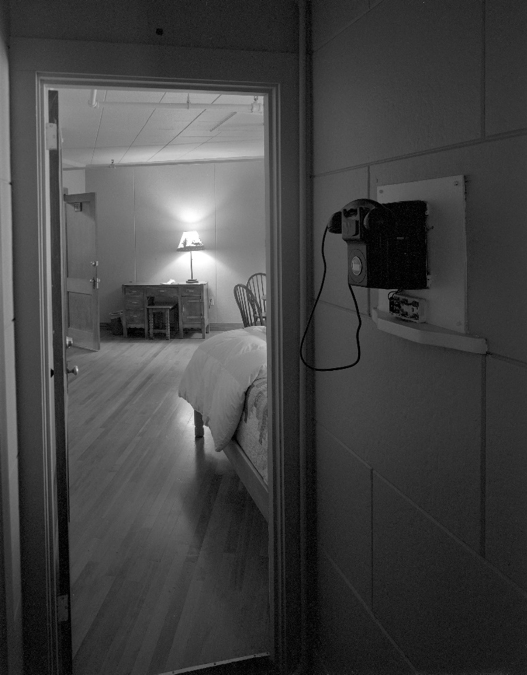 The residency offered a luxury of time and focus that I have not had with other documentation projects. Historic preservation and social impact analyses are hardwired into most environmental review regimes, from state and local laws all the way up to the National Environmental Policy Act (NEPA). Sometimes concerns for old buildings and spaces intersect with interests in daily lives of people living in communities affected by projects that may disrupt them — new roads, railroads, dams, and pipelines, for example. A historic bridge and a Jewish eruv are located at one such intersection along a light rail line under construction in the Washington, D.C., suburbs. The Purple Line is a 16-mile light rail project connecting communities in Montgomery and Prince George’s counties, Maryland, north of the District of Columbia. Because the Maryland Transit Administration is using federal funding to build the project, the agency had to comply with the Section 106 of the National Historic Preservation Act (NHPA) and NEPA. By the time that the Environmental Impact Statement (EIS) was completed in 2014, several potential social justice and social effects had been identified along with several properties eligible for listing in the National Register of Historic Places. Historic properties included a twentieth century garden apartment complex, parkways, and the former Baltimore and Ohio Railroad corridor. Disruptions to local transportation networks, economic impacts, and displacement were among the social impact issues identified. The Purple Line implemented plans to mitigate these impacts and construction began in 2017. As with all large-scale projects, unanticipated impacts were identified after project proponents completed the EIS. 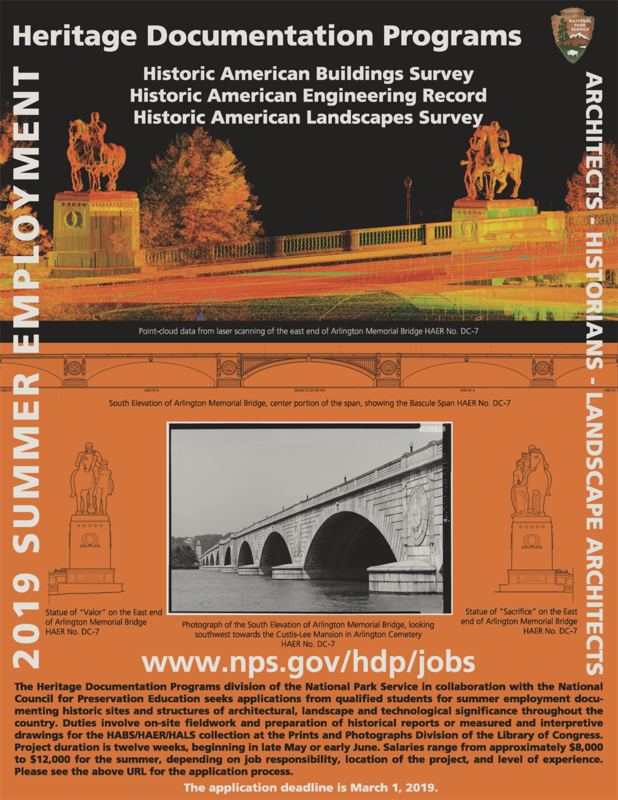 The Talbot Avenue Bridge [PDF] is a property that had been determined eligible for listing in the National Register for its association with the Baltimore and Ohio Railroad as an engineering structure. Located in Montgomery County and completed in 1918, the metal girder bridge formed a vital link connecting a historic African American hamlet with unincorporated Silver Spring and Washington, D.C. Samuel Lytton, a free man of color founded Lyttonsville in 1853 when he bought four acres and began farming there. Silver Spring was a sundown suburb where African Americans could not buy or rent homes; Jim Crow also erected barriers to patronizing many of the businesses located there. Lyttonsville endured more than a century of environmental racism and the social costs imposed by housing segregation and its corollary, concentrated poverty. Urban Renewal in the 1970s disrupted the community and in the second decade of the twentieth century, suburban retrofitting and gentrification threaten to complete the erasure that white Montgomery County residents and leaders had sought for more than half a century. 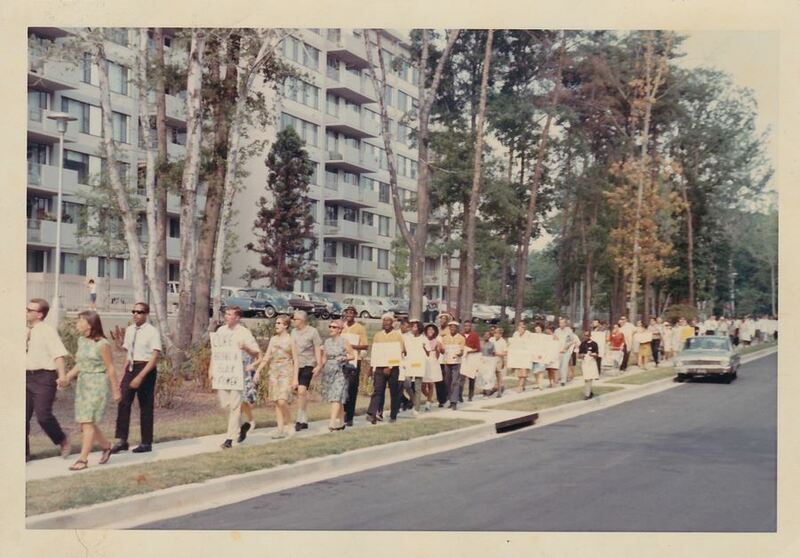 In the early 1960s, observant Jews began moving from nearby Washington into the suburbs. Like their white non-Jewish counterparts, they were fleeing African Americans moving into neighborhoods once segregated by racial restrictive covenants and they were looking to enjoy the American dream of living in the suburbs. Like African Americans, Washington Jews also enjoyed more consumer choices in the housing market after the U.S. Supreme Court in 1948 ruled racial restrictive deed covenants unenforceable. One of Montgomery County’s earliest concentrations of Jewish households formed next to Lyttonsville. A large number of Jews moved into a new apartment complex and in 1963 founded the congregation that came to be known as the Woodside Synagogue. Many Jews also began buying single-family homes in nearby subdivisions. The proximity to synagogues just over the District line and to new ones in Silver Spring quickly made the area attractive to other Jews. More synagogues followed as the population grew in the 1960s and 1970s. The Washington metropolitan area (including the District of Columbia, Maryland, and Virginia) has about 300,000 Jews; the southern part of Montgomery County has about 86,000 according to a 2017 Brandeis University study. The Purple Line cuts through this space shared by African Americans and Jews. The Talbot Avenue Bridge’s social history and Silver Spring’s Jews were completely absent from the Purple Line’s environmental studies. I stumbled into the intersection of these two issues in my research on erasure, displacement, and how history and historic preservation are produced in American suburbs. My first article on the bridge appeared in my blog in early September 2016. Washington Post articles and other media coverage followed. By early 2017, people well beyond Lyttonsville knew about the bridge and how it connected the sundown suburb to the other side of the tracks. Residents in the previously all-white North Woodside (east of the tracks) and Lyttonsville began collaborating on ways to celebration the bridge’s history before its demolition in early 2019. In April 2018 I curated a pop-up history museum on the bridge rails and deck. Five months later, neighbors threw centennial birthday party for the bridge that included live music, art, and speeches on the communities’ histories. More than 200 people were there when the president of North Woodside’s civic association read a proclamation from his board of directors renouncing his neighborhood’s earlier racism and pledging to work more closely with their neighbors across the tracks. The event amplified the bridge’s voice and enabled even more people to learn about its history. As these efforts were underway, Purple Line construction was moving forward. By the fall of 2018, observant Jews living in Lyttonsville and Rosemary Hills began worrying about how they would get to the Woodside Synagogue. Jewish law prohibits driving and many of the Jews living in these neighborhoods intentionally moved there because of the direct walking route to synagogue. The bridge and synagogue are located inside the Shepherd Park-Woodside Eruv, a 12-square-mile enclosure that enables observant Jews to use medical devices like canes and walkers, push strollers, and carry food and books during the Sabbath. Silver Spring’s Jews, like the bridge’s ties to Black history, were invisible to Purple Line planners. Other transportation departments have consulted with local Jewish communities when projects might impact eruvs. 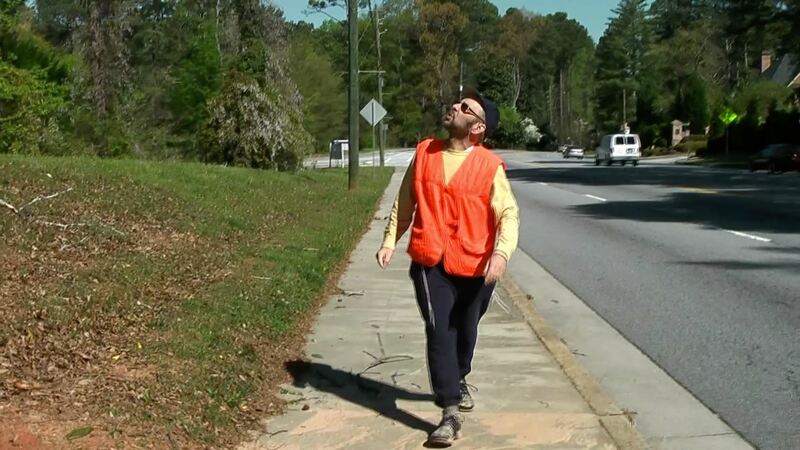 In Georgia, transportation officials in metropolitan Atlanta coordinated with a synagogue to ensure that its eruv boundary remained unbroken during construction. And in Savannah, an eruv was evaluated as a traditional cultural property and initially was determined eligible for listing in the National Register of Historic Places. In Dallas, Texas, light rail planners [PDF] there worked closely with a Jewish community to protect its eruv. 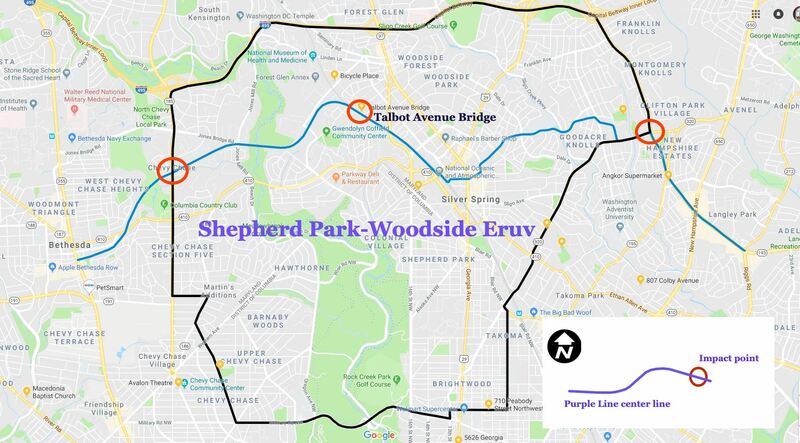 Besides disrupting walking routes to synagogue, the Purple Line intersects the eruv in two places, where it enters in the east and where it exits in the west. Rabbis and eruv managers affiliated with the Woodside Synagogue and Washington’s Ohev Sholom said in interviews that no one from the Purple Line consulted with them. Meanwhile, the Talbot Avenue Bridge occupies a space where Silver Spring’s Black history intersects with its Jewish history. It is a space where people and histories have been rendered invisible. My ongoing research and collaborations with these communities derives from research begun in the Washington suburbs and published in VAN in 2011 (“Courtyards of Convenience: Montgomery County’s Eruvs.”). My focus shifted to gentrification and erasure after 2011 with work on my forthcoming book about Decatur, Georgia. It continued after 2014 was I returned to Montgomery County in search of comparative data. And, it has come full circle with my work on the Talbot Avenue Bridge — a site where erasure, eruvs, displacement, and the imperfect ways in which history and historic preservation are produced converge. 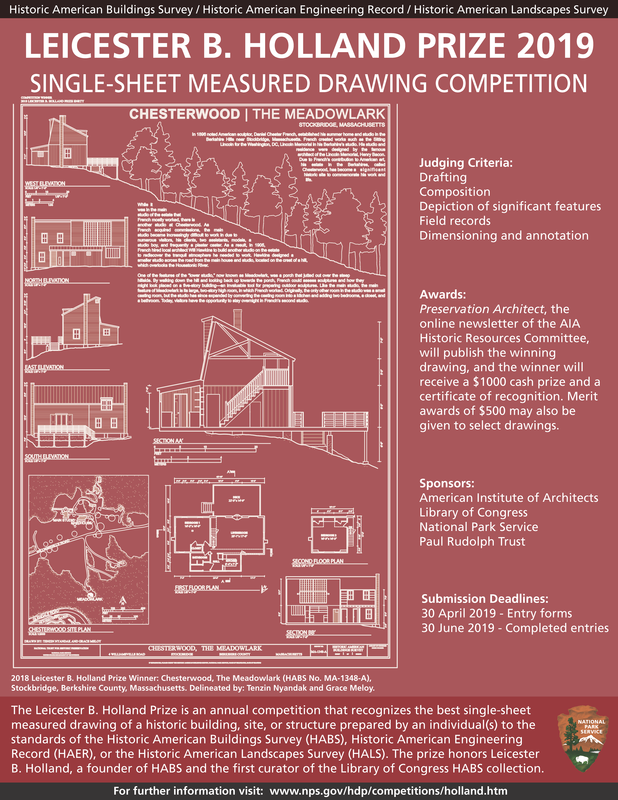 A symposium in recognition of Richard Longstreth's contribution to scholarship on the American built environment. 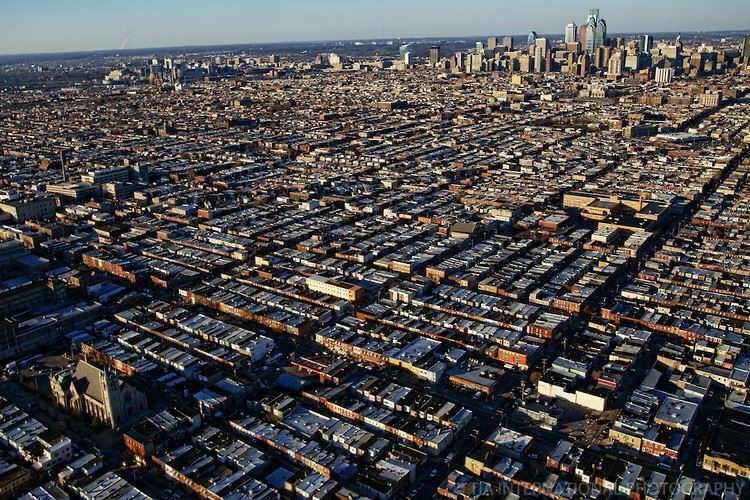 This symposium will take place ahead of the 2019 VAF Conference Landscapes of Succession in Philadelphia. It will involve contributions from a group of former students, colleagues and collaborators whose work engages with, and has been inspired by, Richard Longstreth’s scholarship, teaching and public advocacy. This includes people in academia as well as those in cultural resource management. The various panels at the symposium will focus on contemporary work by a range of scholars and researchers who have explicitly drawn on his lessons or otherwise engaged with the kinds of theoretical and methodological approaches that Longstreth has championed. Given the overwhelmingly historical focus of his work this symposium will naturally look to the past. But it will equally focus on what is being done about the past in the present and will grapple with future directions in how we understand the past and its legacy in the built environment.